My surface book 2 doesn't work with Expresii. This is my second on, Microsoft sent me a replacement and it's still performing terribly with it. It wouldn't use the Nvidia card without me instructing the GeForce Experience to use it with Expresii. But even with the 1060 engaged the performance is terrible. It can't draw a flowing line, it's always faceted. And after a minute or so, it gets really sticky and starts not following the liine of the pen, but creating straight lines. Both of them have done this. I'm guessing this is a Microsoft problem. Re: Surface Book 2 solutions? 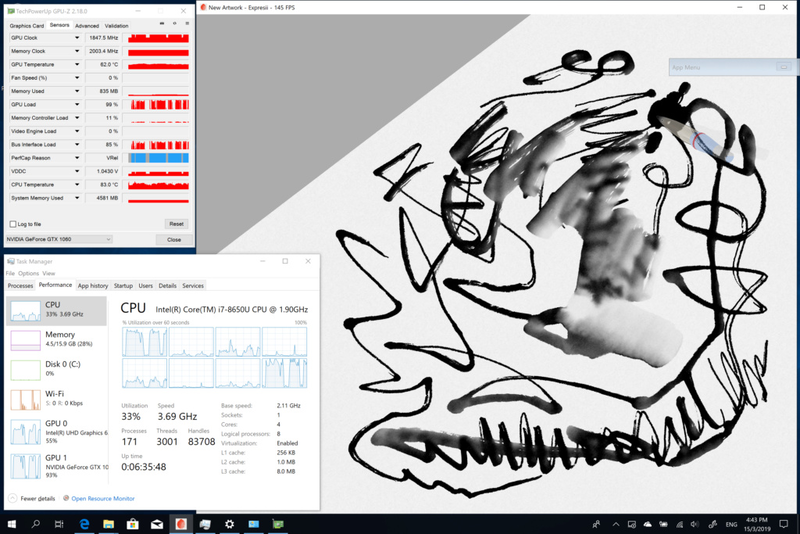 Since I still don't have a Surface Book 2 to test yet, can you please try to see if finger painting (see a screenshot in that thread to see how to enable Finger to Paint) makes a difference on your machine? hm... so it looks like it's not the 'Windows Ink' part that is causing performance issue on your SB2 like in Surface Go's case of the other user. For your information, I get good enough performance on my Surface Pro 2017 i7. 'Good enough' because it's only an integrated GPU. 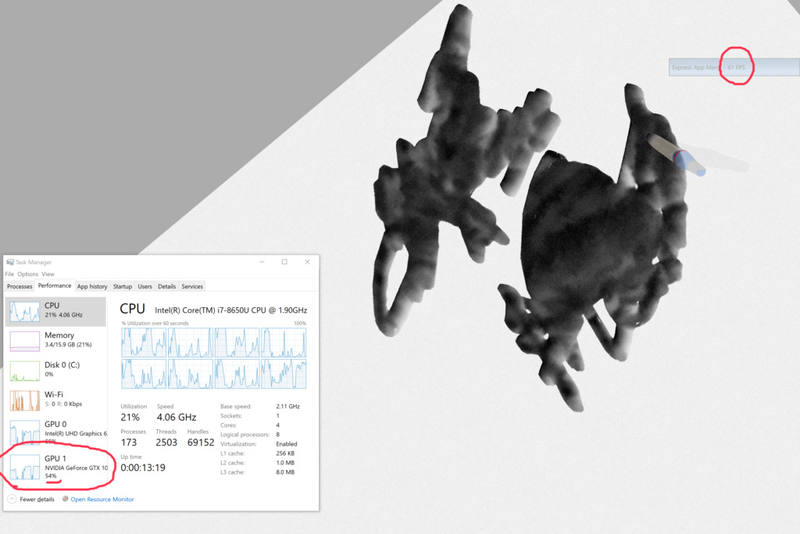 I have been suspecting it's some Windows Update that might be the culprit, since the 1060 is a very capable discrete GPU and I was able to run Expresii fast on the Surface Book 2 13" with the 1050 GPU about half a year ago. And yes, by design, Nvidia Optimus would by default use the integrated GPU in order to save power, so users have to manually do the specification. FYI, those version from May 2018 were before we have native high-DPI support (since 2018-09-16). If you find those version from May 2018 still give non-usable performance, it's more likely it's some changes in Windows itself that causes the trouble. FYI, you don't need to uninstall Expresii first in order to install another version of it. Just run the Update installer. Those 'Update' files in the archive are just "Setup" files without external dll's that don't need to be updated. P.S. Sorry to say I still don't have a SB2 to test yet. Things are going slow around here during the Lunar New Year period. Now, if you're not one of those victims with missing nvidia GPU causing apps to run slow: I got hold of a SB2 15.5" with 1060 GPU, 6GB VRAM to test with. I found that using the default app window size, it performs reasonably okay at around 130 FPS (although I expect a 1060 to give > 150 FPS. hm... maybe because the Windows Power Option was not set to Best Performance). If I resize the app window larger, it starts to perform badly, like what you have reported. 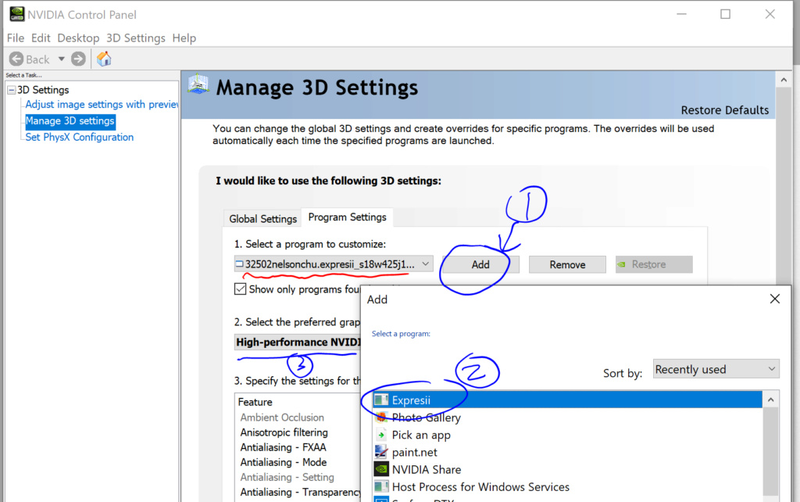 This looks like GPU memory being not enough for the larger window rendering. The slow down memory swapping can cause is just about what we have observed. But how come? It has 6GB of dedicated RAM, which is a lot. Expresii does query the amount of free GPU RAM for nvidia GPU (it displays amount of free VRAM in App Menu>System>Undo tab) and will lower the undo level if it finds free RAM too little. FYI, I found that GPU driver could replenish (should be via memory swapping transparent to the app) the amount of free memory reported to an app when it keeps asking for more. On my desktop system with 1060, similar slow down is observed if I intentionally use a lot of undo buffer (you can set the undo level higher, and keep stroking to fill the undo buffer). I'd do more investigation. Meanwhile, you can try having the main window of Expresii smaller or lowering the undo level and see if it helps with the performance on your system. Similar issues here. I have an SB2 15 with the 1060. If I keep the canavas zoomed out then performance is relatively slick but if I zoom in then I get very sluggish / chugging FPS. I'm forcing the program to use the dedicated graphics, btw. FYI, I had an SB 1 with Performance Base last year and Expresii worked very smoothly on it.. Thanks for your info. Good to know SB 1 with nvidia GPU is working well with Expresii. So far, seems only the 15" model with GPU 1060 has the performance issue, if for SB2. Anyone with a 13" SB2 with 1050 also has such performance issue? 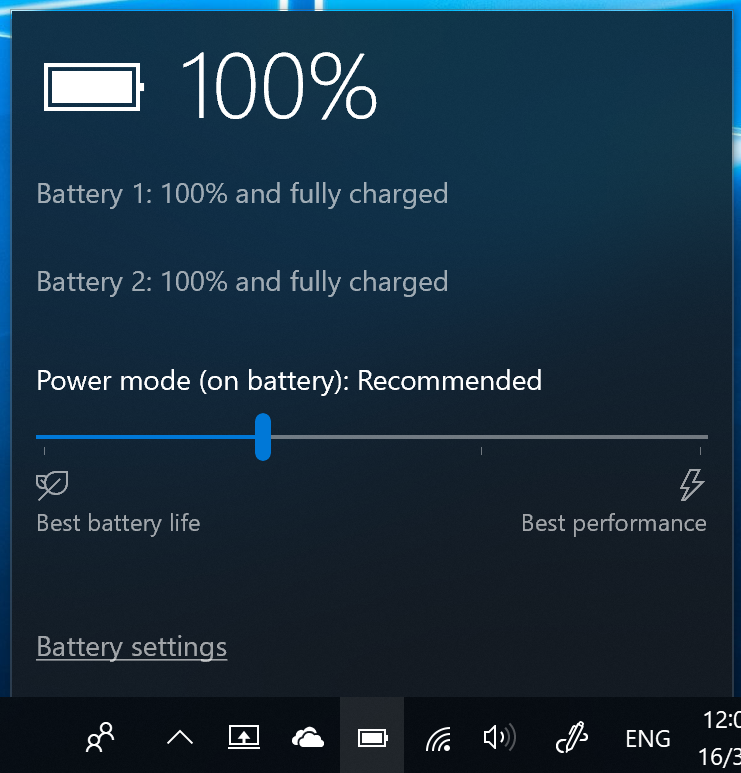 and it's possible the fix also fixes the issue on Surface Book 2. Appreciate it if you can verify that if you have the SB2. Thanks! Tested latest version on SB2 w/ 1060 - works! Great, much smoother now, no lag noticed. Cheers! Great, thanks SMagliocco for your confirmation! If no more complaints from other users for a while, then I will mark this issue resolved. When SMagliocco said "no lag noticed", I assume it is 150+ FPS. Could SMagliocco let us know how many FPS you get? I finally acquired a SB2 16". Ran Expresii fine with 1060 GPU at 140+ FPS default windows size, 100+ FPS if Fuilscreen. This is the case when Win10 version 1803 OS build is 17134.1 when PC is just reset, and 17134.556 after running for a while. Will update Windows 10 to later versions and see if that makes any difference. Stay tuned. I also tried running an older version of Expresii from around April 2018, when I was testing the SB2 13.5" (https://www.youtube.com/watch?v=0c0Ca-pZgUc). That was before I added high-DPI support. I got 150+ FPS at that time with the 1050 GPU. On the 16"'s 1060, I get 200+ FPS even in fullscreen. So, it looks like nvidia driver does impact the performance. I looked for options in the nvidia driver and also GeForce Experience (with Battery Boost, Whisper Mode) and tried to opt for getting the best performance but all these don't make a difference. So it looks like MS (and/or nvidia) has make an implicit power capping. hopefully they will look at the issue. No response from nvidia on the driver feedback yet. Recently we're happy to find that nvidia is pushing out what they call the 'Creator Ready Driver" (vs Game Ready Driver). However, installing nvidia Creator Ready Driver v419.67 doesn't help our situation on the SB2. Still need to revert to Gaem Ready Driver 319.35 to get back the full performance. Still waiting for nvidia to response. I have already tried to force NV card on the Nvidia control panel for Expresii. But when I get Expresii running, there is no sign that the NV card is working, and the FPS is only 45-65. FYI, my Expresii is purchased from windows store, it's a store version. The Store version of Expresii is displayed as "32502nelsonchu.expresii....". Let me know if you still can't specify to use nvidia GPU correctly.